These delicious little cakes can be served as a main course or served as a side or appetizer - even as hors d'oeurves! Makes about 3 dozen appetizer-sized cakes. You might also like these Spectacular Smoked Salmon Recipes. 1. In a sauté pan over medium heat, cook the bacon until crisp. Remove the bacon, reserving, and drain off all but 2 Tbsp of the fat. Add the corn, onion, pepper, celery and thyme to the pan, cooking until the onions are translucent. 2. While cooking the vegetables, boil the potatoes in salted water until tender and drain. Let potatoes cool for 10 minutes and mash roughly. Add the cooked vegetables to the cooled potatoes and flake in the salmon. Stir in the reserved bacon and season to taste. Break one egg into a small dish, whisk with a fork and stir into potato mixture. 3. Shape this mixture into little balls (an ice cream scoop makes this easier) and press to flatten. To cook, heat the olive oil in a sauté pan over medium high heat. Whisk the remaining 2 eggs in one bowl and place breadcrumbs in a separate bowl. Dip each chowder cake in egg to coat completely, then dip into breadcrumbs. Place the cakes in pan and cook about 4 minutes on each side, turning carefully. 4. 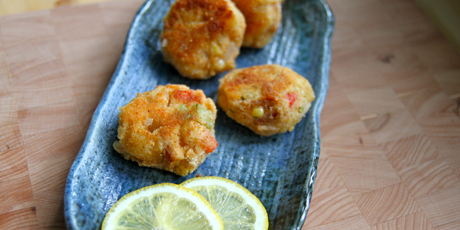 The chowder cakes should be served warm, with a little lemon or other creamy sauce. The cakes can be precooked, chilled and reheated for 12 minutes in a 325 F oven.